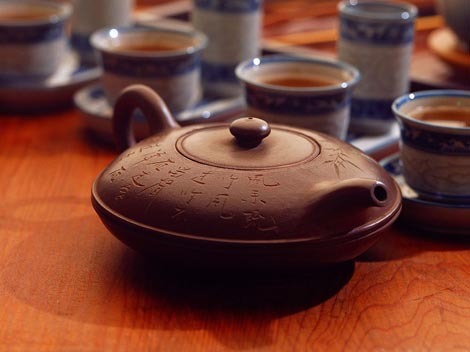 There is a long history of drinking tea in China. Ancient scholars used to drink tea together and regarded it as a great fun. Drinking tea played an important role in the lives of ancient people. 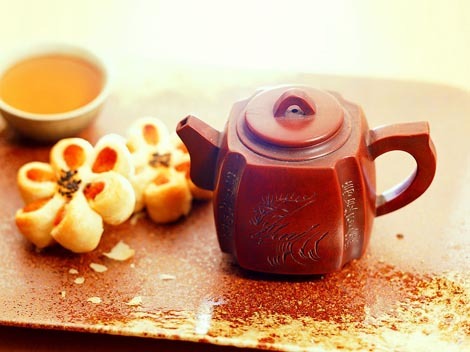 In the Tang dynasty, there was no difference between tea wares and eating wares. 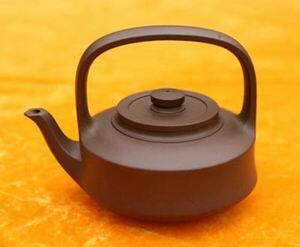 Along with the popularization of drinking tea, the ideal teapot ─ the Zi Sha pot ─ appeared in the late of Tang dynasty. This kind of pot is made of mud named Zi Sha and its color is mauve. It has a simple and unsophisticated form, and was quite popular during the Song dynasty. The well-known poet Ou Yangxiu once wrote poems about the pot. During the period between the Song and Ming, Yi Xing became the production center of Zi Sha pots. Now, the Zi Sha pot made in Yi Xing is the best quality. Yi Xing is located on the boundary of Suzhou, Zhejiang and Anhui. It was a famous place for tea during the Tang dynasty. It is recorded that Gong Chun, an artist in the Ming dynasty, was the first best maker of Zi Sha pots. His works were named Gong Chun pot. Even then, there were comparisons between Gong Chun pots and treasures. Hence, the production of Zi Sha pot boomed. In the middle of the Qing dynasty, Cheng Hongshou, a well-known scholar, took part in the production of Zi Sha pots and integrated calligraphy, drawing and arts, which was accepted and affirmed by society and named the Man Sheng pot. This kind of pot was another milestone in the history of Zi Sha pot production. After that, many artists took part in the drawing and calligraphy of Zi Sha pots.